Love geek and gamer culture? 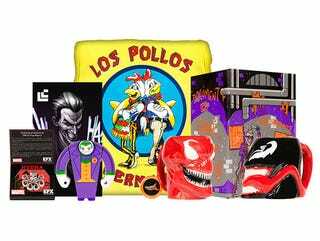 Check out Loot Crate - the subscription service that delivers a surprise box of new and exclusive gear, collectibles, toys, apparel, art, and more right to your door every month. It normally costs around $20 / month, but this weekend, Kotaku readers can save 15% and score a 3 month membership for just $49. Loot Crate sends out a box of gear to your door every month, and the content is always a mystery. Each month’s theme is announced in advance, and looking at previous months gives you a good idea of what to expect — awesome collectibles, toys, apparel and art, including plenty of exclusives. This deal includes shipping to the continental US, but is available in Australia, UK, Norway, Sweden, Ireland, Denmark, Netherlands & Germany for $71.40. Your Loot Crate will arrive between the 20th-28th of each month. Interested? Find out more at the link below.